The best extension cord for your generator is one that is specified to handle the power that’s being delivered between the generator itself and the device or devices plugged in. I suspect that some people don’t know that it does make a difference having the right or best extension cord (or cords) when powering appliances and other devices. If the extension cord is ‘too small’, it will potentially restrict the power necessary to safely operate the loads that are plugged in. The cord will heat up. What do I mean by ‘too small’? I mean the internal wires themselves. Wire is rated in “gauge”. Thick wire has more capacity for power than thin wire (logical). Don’t let the thickness (appearance) of the cord fool you! While generally speaking a thicker appearance (fatter cord) will probably mean the wires inside are heavier gauge, it’s not always the case. It could just be a thicker outer jacket. There are LOTS of extension cords that are #16 and #14 gauge. What you want is at least #12 gauge wire conductors in that cord. Check the package. Somewhere on the label it will indicate this! For wire, the smaller the gauge number (#) rating, the more power it can handle. So #12 can handle more power than #14, etc.. The NEC (National Electrical Code) sets limits on the amount of Amps (current) that wire conductors may carry (for safety / overheating). There are variations depending on wire insulation/jacket, temperature, use. Not more than 3 conductors in cable. Note: Extension cord specs vary (materials and other factors). Check the label! Why is #10 gauge Extension Cord Better? There are a number of factors that contribute to the ratings for extension cords and they vary somewhat. However generally speaking here are some specifications when using Ohms Law when applied to the NEC limits listed above. Note: The “/3” simply means there are three wires within the insulation of the extension cord. One is for ground (green), one for “hot” (black), and the other for neutral (white). How does length affect extension cord ratings? Voltage drop. 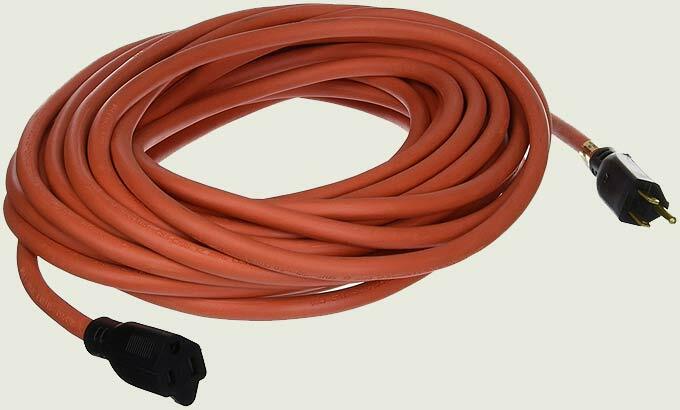 Most typical extension cords for outdoor use come in 25 foot and 50 foot lengths. All wire has some resistance (depends on conductor type and other factors). The longer the wire (extension cord) the more resistance (and voltage drop). With regard to generator extension cords, I wouldn’t sweat it. In most cases you will be 50 feet or less. When you’re looking at 100 feet (or more!) then this becomes potentially problematic. In these cases it’s better to use heavier gauge (#10 better than #12, etc..). Can I use 2 extension cords with my generator? If your generator puts out more power than the rating of one extension cord, and if your generator has multiple household style outlets, you might use more than one extension cord. Just don’t overload your cords. For example, one of my generators is rated for 3500 watts. It has several conventional outlets (and a high power multi-prong outlet). I might use two 12/3 extension cords to deliver power inside to my various appliances if need be. Some are rated for indoor only use while others are designed for outdoor use. For use with a generator, you definitely want outdoor rated. The differences are in the insulation material, strength, and the ends themselves (plug & receptacle design). Warning signs of overloaded extension cords? So what is the best extension cord for a generator? A good general purpose choice is a 10/3 (#10 gauge) outdoor rated. 10/3 will perform better than 12/3 and NEC specs indicate power handling up to 3600 watts. Additionally there will be less voltage drop under load. Theoretically a longer run. Tip: My experience has been that you are not going to find a 10/3 extension cord with a household style plug/outlet that lists its rating higher than 15 amps (or 20 amps with a T-blade plug) due to regulations (even though the #10 wire inside may be capable of handling the NEC rating). You can purchase specific 30 amp generator extension cords / cables. Thanks for the reminder Ken. We need to replace one of our extension cords. I keep thinking about it, then forget it. This will help me get the proper size. The third wire (usually green cover) is a ground – you might want to mention, if the generator is not grounded, what safety risks exist as you hold that power tool or appliance. But I am not an electrician. This is great info to share. Also, there are some heavier gauge cords available that have an intergrated GFI. One should use these on small devices that don’t have an internal protection system from overload or on larger devices that you want some additional piece of mind for. 1. If the cord is crushed or has ‘nicks’; repair or replace it BEFORE you use it. 3. Even if your appliance is not wired for with a Ground Wire; use a ‘Grounded’ extension Cord. 4. Do NOT let the ends of the cords lay in water or get wet, you WILL fry. 5. If you don’t know what you’re doing; DON’T do it, get help. 6. If the cord ends are damaged at all or crushed; replace them NOW! 7. Lastly, do NOT burn your home down or electrocute yourself/someone because you ‘improvised’ some foolishness with extension cords and electricity, BE SAFE! Remember just because you have a 100 foot code does not mean you need to use a 100 foot cord, use the shorter cord that will ‘carry the load’. Do NOT pinch a cord in a window or door when running the cord(s) into the house. Lastly, if you have a cord that’s to short, do NOT put the Generator inside !!!!!! Pretty much never use anything less than 12/3, am a carpenter so use them daily, i used to have a bunch of 10/3 cords but they recently gave up, looking to replace them but am just going to make my own so bought a 250′ spool of 10/3 SO cable, will use Woodhead cord ends. Curious what the thoughts are with running the 12/3 then a power strip and 3/4 items off the strip. One is normally a fridge, then a few lights and radio. I never put more than one large appliance per extension cord , being window unit or fridge/freezer. I would think you would need an industrial power strip/bar. All supply cords/devices should have the same capacity as the extension cord and if not grounded, you could become the live wire. It goes by amps. look at the rating stickers for the cord/power strip. Then look at the total of the items you want to plug in. The plug in items should be 80% or less of your cord/power strip max. Do not go over the amps of your power cord when plugging into a power strip. Add up the amperage of each item, which you would be using off of a heavy duty power strip. Do not forget about the ‘power surge(s)’ when an item is being used, or starting up of a major appliance. Example a fridge might have a running of 10 amps but the start up is 20 amps until it levels off. It is the start up that is the surge which causes the damage, most folks do not understand this rather important item, this was explained to me by our generator repairman years ago. Good article. Good comments. Thanks, Ken. By the way, is there any way to know the rating of that old extension cord in the garage? I don’t see any markings whatsoever. Examine the cable carefully ideally under an illuminated magnifier. You should see molded in, or printed on the jacket something like 12-3, 14-3 or 16-3 along with other info on the cord. You have to look really closely to see it. Another good clue is the size and price. 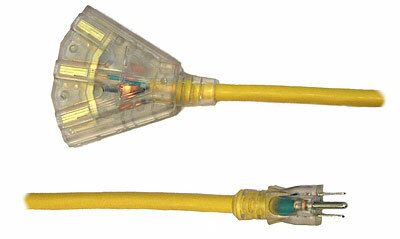 An extension cord that costs $15 and is only a little thicker than a pencil will most likely be 16-3. A better quality 12-3 cord might cost $50 and be nearly as thick as a magic marker, and noticeably heavier as well. One subject closely related to generator/extension cord useage is that of bonding between the ground and neutral there at the generator itself. Bonding refers to the ground wire and the neutral wire being electrically connected together there at the generator. The ground wire and neutral wire should only be connected together at one place in your house wireing, usually this is done in your house. Generator bonding is usually done at the factory and most people do not know this. This extra bonding will cause a ground loop to exist in your house wireing. See the National Electric Code why this extra bonding must be removed at the generator. I hope this is not confusing. I don’t think this would apply if you are just using extension cords and plug strips to distribute your generator power inside the house. If your generator is connected through a TRANSFER SWITCH to your house wiring (only safe way to connect a grid-connected house BTW) then this should be investigated further. Okay…..So my little generator is on wheels and when need it I roll it outside and plug it into a 22o volt outlet by my meter. Then I throw a manual disconnect switch which allows the generator to send power to the house after I start it. The line from the street is disconnected. When I see lights on at my neighbors I turn the generator off and reverse the switch. So am I going to burn my house down or electrocute one of my grandkids? I do have a ground wire that I run from the terminal on the generator to a grounding rod in the earth. This is worrisome. I paid a good chunk of change to get that disconnect added as I didn’t want to kill a lineman working down the street. How many prongs on the plug that goes between the generator and the house? Four. sorry about the delay in replying. OK your plug has 4 prongs, most likely 2 hot, one neutral, and one ground. This is the same as my 120/240v setup. My guess is that the reason code says you do not want a grounding loop is that some of the neutral current could flow in the ground conductor. Texas boy, or someone else with extensive electrical experience, could you please elaborate as to what exactly would happen in this situation? How you should treat the neutral conductor depends on your system design. Neutral conductors must be grounded to prevent inadvertent potentials on conductive surfaces of equipment, enclosures and cable conduits and raceways. Alternate sources can make this process confusing, but referring to the NEC can help clear the problem up. Sec. 230.95 requires ground fault protection for solidly grounded wye. How you should treat the neutral conductor depends on your system design. Neutral conductors must be grounded to prevent inadvertent potentials on conductive surfaces of equipment, enclosures and cable conduits and raceways. Alternate sources can make this process confusing, but referring to the NEC can help clear the problem up. Sec. 230.95 requires ground fault protection for solidly grounded wye electrical services of more than 150V-to-ground, but not exceeding 600V phase-to-phase for service disconnects rated 1,000A or more. Why did this requirement come about? The most popular power system in commercial, industrial, and institutional facilities is 480/277V, 3-phase, 4-wire, wye-connected. Equipment design advances in the late ’60s resulted in a rise in popularity of 277V lighting systems. As more facilities installed these systems, the occurrence of electrical fires increased. Investigation showed that 277V systems increased the likelihood of arc faults to ground. Since arc faults have impedance, the phase overcurrent protection often would not detect these faults until significant damage had occurred. The NFPA responded by revising the NEC to include protection against arc ground faults. Since the expected current in an arc fault is considerably less than that of a line-to-line or line-to-neutral fault, phase overcurrent protection devices were taking too much time to recognize and interrupt the faults. In response, several manufacturers began producing ground fault arc current detection schemes that depended on the presence of a known return path for the arcing current to the power system neutral point. These schemes made it important to pay close attention to neutral conductor grounding. When I get a ‘bad’ extension cord, I cut it in pieces and throw it in the trash. That way no one will fish it out of the trash and use it. I do the same with welding hoses. Ken, it might be good to point out that the different sizse of wire will carry different amp loads at 220 volts, like when you are using a welder or a well pump on 220v. I use a 50′ 10/3 to get from the generator (which is far outside) into the house. From there I’ll go 12/3. Hello I do not post much but I just happen to be a master electrician and feel a little obligation to this. 1. Most all portable generators have a ground lug on them. If not one should be installed on the frame. 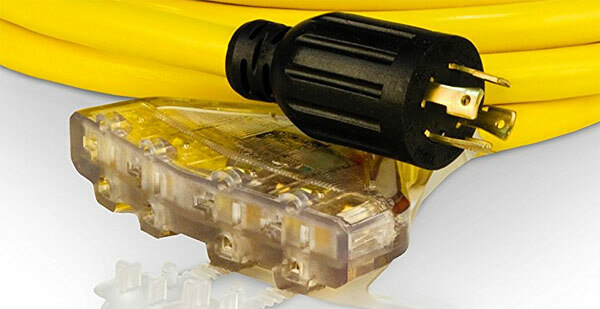 You should connect the grounding lug to a ground rod with ground wire. This is usually near your electrical meter. You need this ground to get a proper neutral and for your safety. Do not count on the generator sitting on the groind to give you a good ground. 2. You should use a quality electrical meter to check the voltage of your generator. Check the hot wire (black) most of the time to the neutral wire (white) and then check the black to ground wire (green). You should have between 110volts and 125 volts AC. To check 220 volts use the same method but add checking the second black (some times red) to the other black wire. You should have between 212 volts and 230 volts AC. The reason for this is to keep from frying up your stuff. And having the info for the math I am going to give you. Now you canuse your generator. 3. Extension cords. Bigger is betrer. Ken and several of the comments are correct with their info. I would like to add. For every 100 feet you will have a voltage drop of 1 to 3 volts depending on the quality of the wire in the cord and the cord itself. To figure out amps you must divide watts by volts to get amps. This is why you checked the voltage earlier. So if your microwave runs at 1800 watts and your generator is putting out 123 vac. You are using 14.63 amps. Terms you should know FLA-full load amps usually start up amps. RLA-rated load amps, usally runnig amps to keep it simple. 4. If you connect your generator to your house please always check to make sure your main breaker is off. The transformers the power company uses work both ways thousands of volts in 120/240 to your house, your generator 120/240 out to the transformer thousands of volts to the power lines. And the power company linemen really do not like that. There is more but this should keep you safe. Exactly, and never use an ungrounded generator! There were several deaths here because of ungrounded generators. Always happens after a storm, also a lineman was electrocuted from a generator being back feed to a house. Always read and understand the owners manual with your generator. When I was working in lighting we had many sales meetings with the sales reps and wire/cable was explained to us like it is a highway. The more lanes you have the less congestion. Same with wire the larger the gauge, which is a smaller number, the easier power travels so to speak. I purchased a 20 amp cord for the freeze dryer because the dryer will at times pull 16 amps. Also it is plugged into a 20 amp socket. This was suggested by the Harvest Right salesman. Found a 20 amp without bells and whistles on Amazon. Could not find one at any local store. Lots of good info in the article and in the comments. I would add one thing, get a few spare cords and high amperage ends. I like Hubble brand of cord ends, good stuff that is well made. Re reading this brought back some memories. One of the marinas where I lived on my boat had 20 amp service on the docks. Most marinas have 30 amp service and when you think about it a single 30 amp plug doesn’t allow you to pull much power for the needs of living aboard a boat. 20 amp was even worse. What some folks did was remove the 20 amp breakers in the power boxes on the dock and put 30 amp breakers in. The wiring wasn’t designed for this so as people at the beginning of the service started pulling more power (amps) resistance further down the system started going up and voltage started going down. Result was boats were catching on fire from the heat from the increased resistance in the outlets on the boats. No lives were lost but one fellow was seriously burned.